The sound of dripping water is nerve-wracking but the sound of running water is soothing and calming. If you want that soothing sound anywhere you go in your home, the Only Cordless Rechargeable Fountain will make sure you have it. 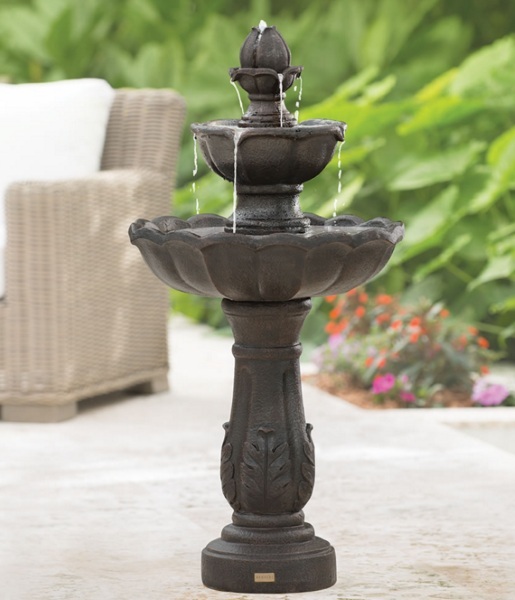 This is a three tiered fountain that is not restricted by a connected water or power source. It has a very classic look, like the type you would find in your garden, perhaps with little birds bathing themselves in its waters. It is made from PVC and painted so it’s much lighter than the stone it resembles. There are no cords or panels for solar power on this. It can truly go anywhere you like. It holds two gallons of water and has and turns itself off automatically after one or four hours. You can also turn it off manually. It will run for two months on a single charge and the removable batter can be charged to full power in 12 hours. The Only Cordless Rechargeable Fountain is $299.95. Donyae Coles – who has written 3185 posts on The Red Ferret Journal.